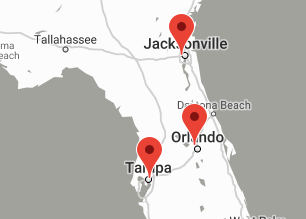 CSG is a Florida owned and owner operated business specializing in commercial window washing in Florida, and both interior and exterior building services in Orlando, Jacksonville, Tampa and surrounding areas. At CSG we are dedicated to meeting all our customers expectations by displaying the highest standard of quality through honesty and integrity. Customer service is our number one priority and we will continue to serve our customers with the highest quality workmanship, respect, and complete customer satisfaction. Commercial window washing is one of the tasks some building owners can forget to keep up with. It is important to clean the windows at your facility and this job should not be neglected. Dirty windows turn tenants away, deter customers from making repeat visits and give the building an overall unkempt look and feel. When windows are sparkling clean, you, your staff, tenants and visitors are able to enjoy outside views and your facility will look cleaner in the process. Hire a professional commercial window cleaning company in Florida, like CSG. The results will brighten up your day. Working one-on-one with clients, CSG delivers customized service to accommodate the facilities specific needs. CSG maximizes returns with shiny, clean windows, and minimizes your cost! CSG’s team takes the extra time to make sure the job is done right and to your satisfaction. When complete, your windows should sparkle and be free from dust, dirt and other debris. We also take the time while providing window-washing services to inform you of any minor issues technicians encounter that may become a problem in the near future. When it’s time to have your windows cleaned, give CSG a call for a free estimate. CSG is here to help you improve the look of your commercial building. Your free quote will be determined based on type and amount of windows your facility has. For an accurate quote, contact CSG today.